We have released some really exciting features for all customers in RepricerExpress that we’re sure will make managing your pricing on Amazon and eBay even easier. At a glance, you can also see your Buy Box percentage over the last 30 days from a tidy little chart! We’re rolling out a super new feature called, Product Status Preferences where you can define what is flagged as being in a Price War, a Best Seller and what’s Low Stock. Values are in there by default but you have the option to enter your own, per marketplace. These will be super useful in helping you identify products that may need different pricing strategies to perform better. You’ll be able to see icons relating to any product statuses directly from My Inventory screens as well as a new much-requested feature—RepricerExpress will now show products that have FBA Long Term Storage Fees due. This will give our sellers plenty of time to reprice and move stock quickly instead of incurring more storage fees from Amazon. Just go click any product to see this in action! #4. 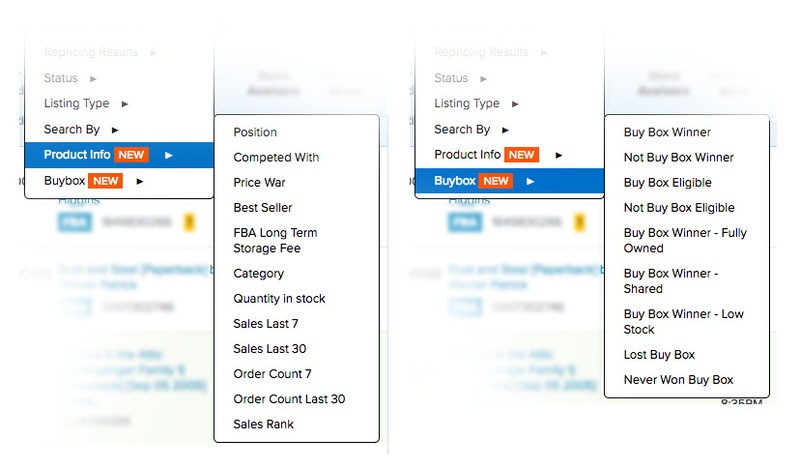 Filter Products According to Sales, Sales Rank, Category, Buy Box Performance and lots more! Auto-move products to a more aggressive repricing strategy if sales have been non-existent for six months. We hope these updates and the ones planned for the coming weeks help you achieve more sales and profits on Amazon and eBay in 2017. Thanks for reading. If you have any queries, just reach out to our support team. Get access to all the new features as well as the existing ones, sign up today for your FREE 15-day trial of RepricerExpress.